The Patterns for e-business are a group of proven, reusable assets that can be used to accelerate the design and development of e-business applications. 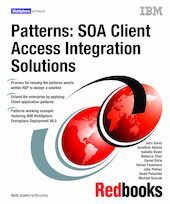 This IBM Redbooks publication focuses on how to reuse the SOA Client - Access Integration patterns to extend enterprise applications to a wide range of client devices such as laptops, PDAs, and mobile phones. Part 1 presents the client access solution domain and benefits of using patterns. We introduce key technologies to serve as a foundation for understanding the Access Integration patterns. Part 2 guides the reader through the process of reusing the patterns assets within the context of the RUP to accelerate the solution design. We include selection criteria to navigate from the Business and IT drivers to the appropriate Application pattern or patterns, and supporting Runtime pattern, component model, and Product mapping instantiated by IBM software products. Part 3 demonstrates how to reuse the patterns for a fictitious ITSO Insurance scenario. The scenario highlights the Distributed Rich Client application pattern, which is used to extend the existing SOA enterprise application. The solution provides mobile adjusters with the capability to work on-site with the customer in a disconnectable mode and sync data with the enterprise when connected to the network. The Runtime pattern is instantiated by IBM WebSphere Everyplace Deployment V6.0.